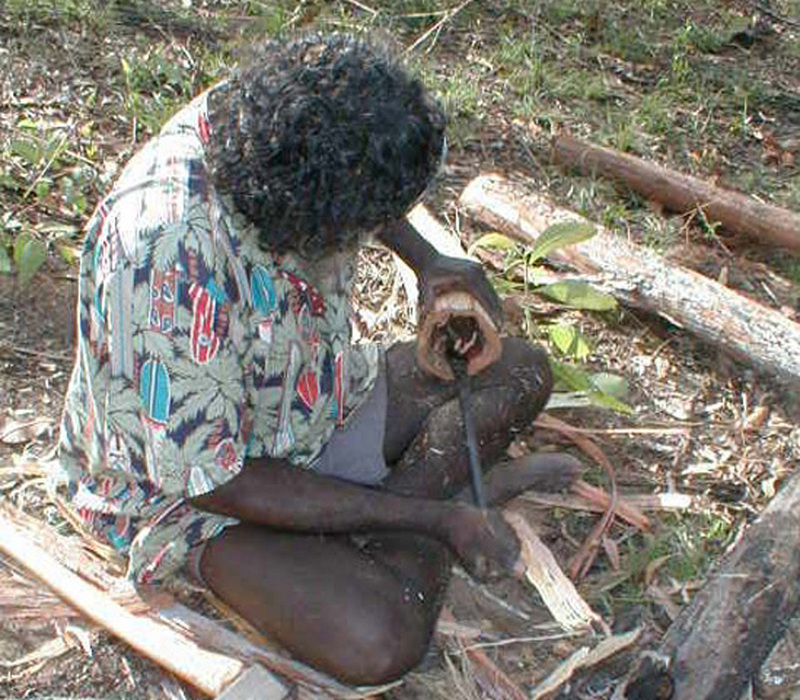 Djalu’ crafted this excellent yidaki in mid-2004. 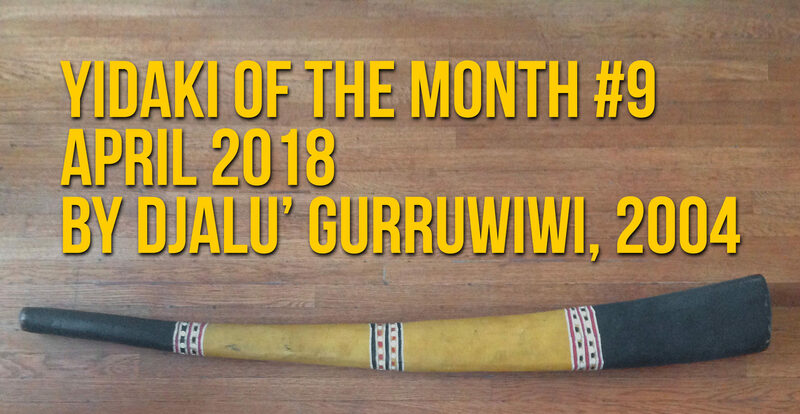 I bought it for myself, but it became Djalu’s standby for a few years, seeing regular use in ceremony and performance, as seen in this clip from the Yidakiwuy Dhäwu. 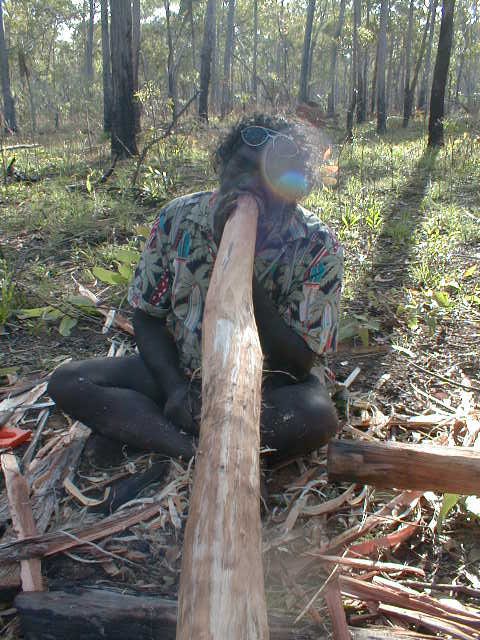 Here, Djalu uses this powerful instrument to demonstrate the song Bärra‘ or West Wind at the Garma Festival in 2004. If you haven’t seen that clip already, then you haven’t done your homework as a student of yidaki. 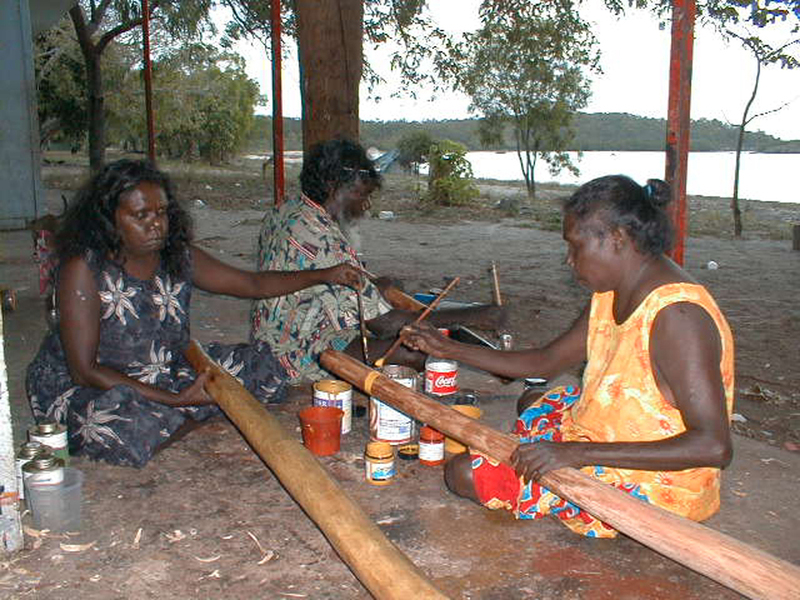 Finish checking out this page, then go read www.yidakistory.com/dhawu/yolngu-rom/stories-about-yidaki-djunggirriny/ and the rest of Yiḏakiwuy Dhäwu Miwatjŋurunydja. 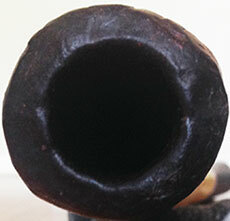 The bottom end, or possibly a portal to another dimension. This is truly an incredible yidaki. Great warmth, great clarity, great playability, great power. If your lips are in shape, you can trail off the warm-sounding trumpet note like a bell. 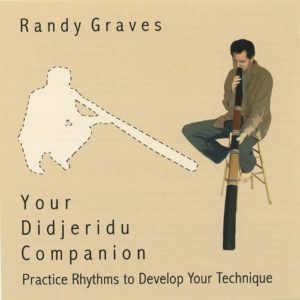 To me, this one sounds like the definitive Djalu’ tone. 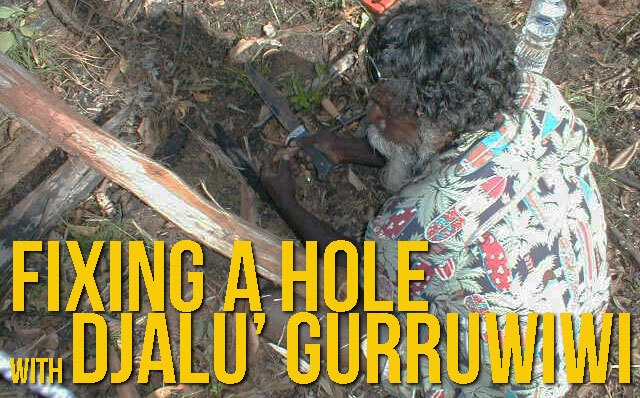 It’s quintessential Djuŋgirriny‘, hence his use of it while telling that story at Garma. Here he is playing Bärra‘ again. 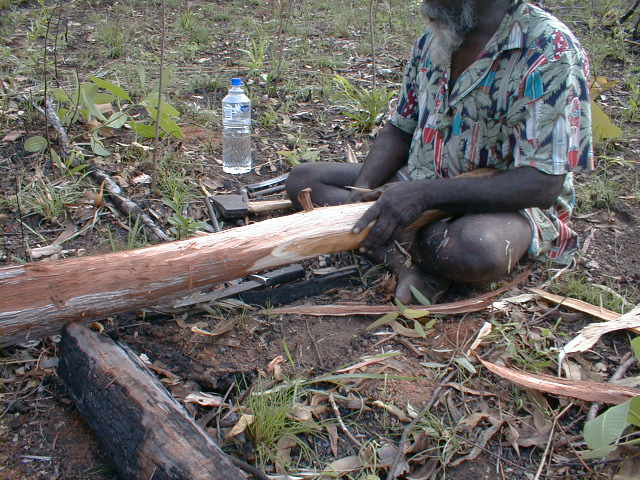 The late Milkayŋu Munuŋgurr loved it, too. 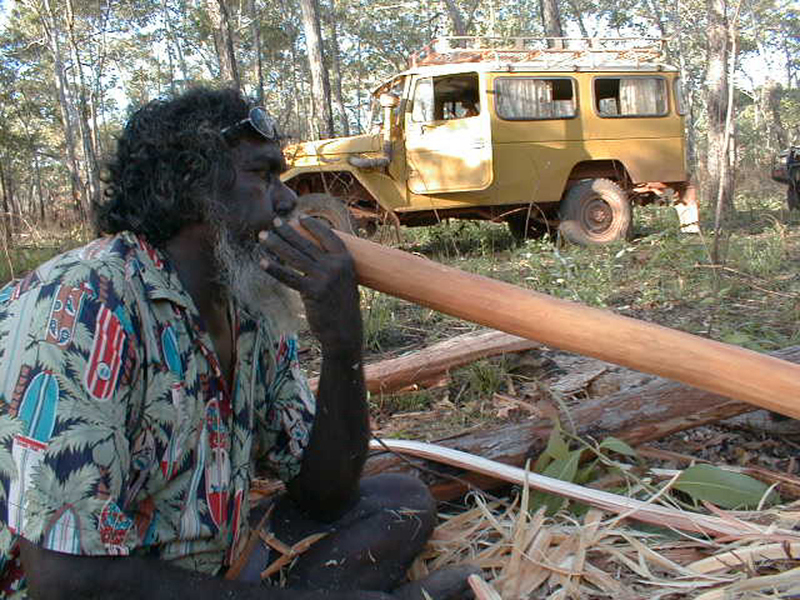 He said he’d love to record with it, although he’d prefer a smaller and lighter yidaki to carry around in ceremony! 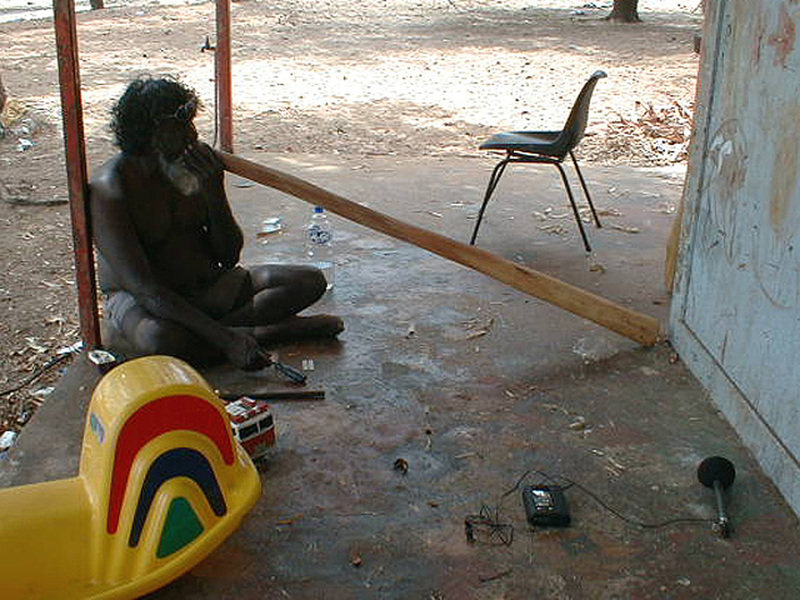 The late Mirrwatŋa Munyarryun shows us some brief, simple yet beautiful playing on it. 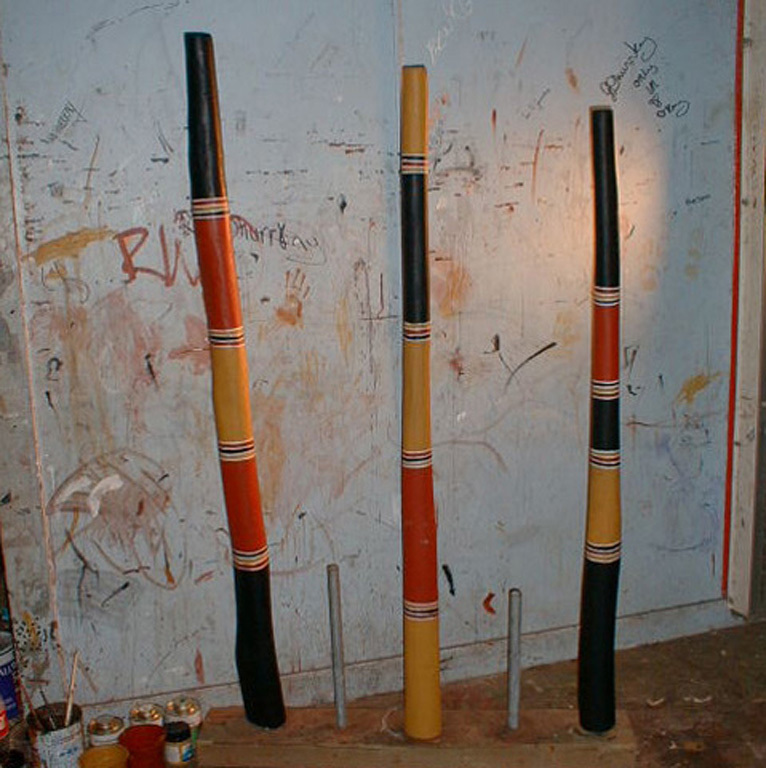 He, his brothers and cousin Ŋoŋu at Dhalinybuy all said it was a great “bass” instrument they would happily use at ceremony. Lastly, here’s me from my Didjeridu of the Day series on Instagram last year. 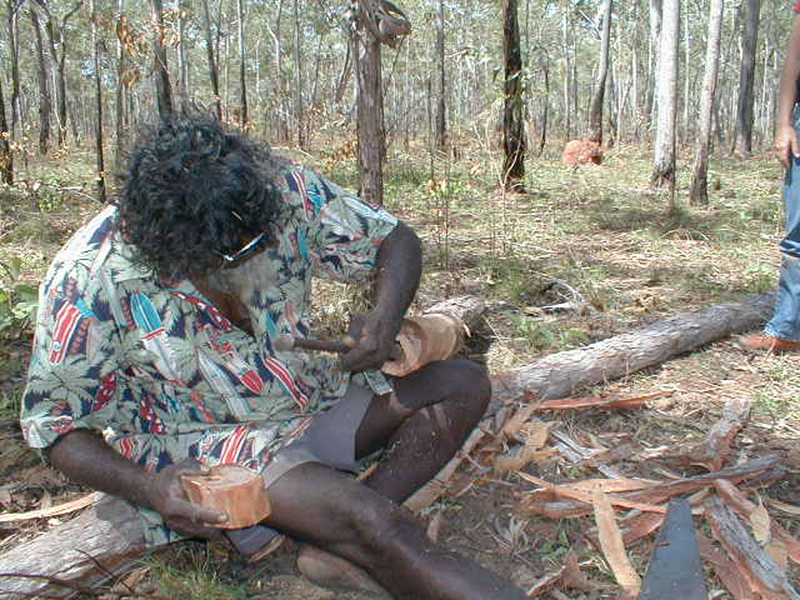 Back in 1999, Djalu’ blew my mind with his ridiculously simple fix for a knothole in a new, in-progress yidaki. Maybe he did this all the time. I’m not sure. I never happened to see it again. I present the photos here online for the first time, in their full, highly-compressed, 640×480 1999 digital camera quality. 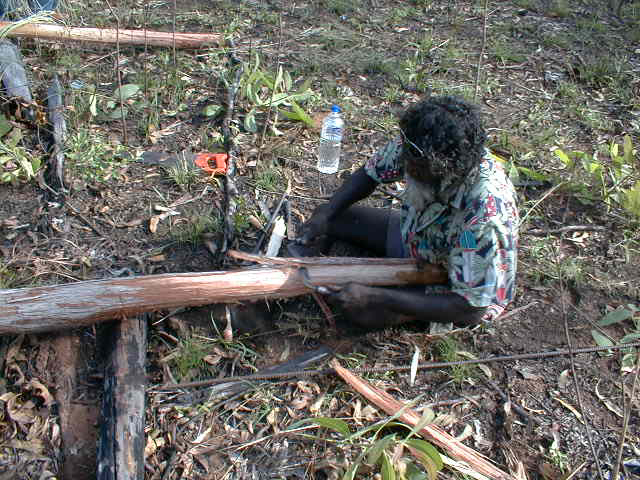 Djalu’ found a particularly good yidaki, so sat down to work on it right there in the bush. 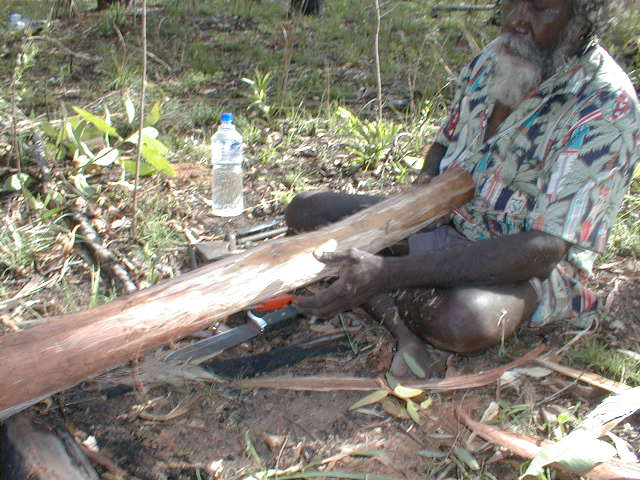 Here he is carving away the bark and outer layers with a draw knife. Whoops! 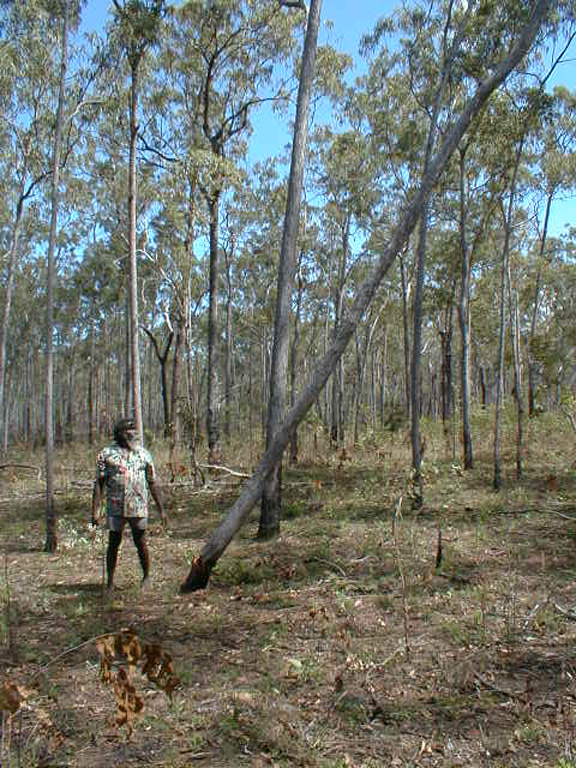 It’s hard to see, but in the yellowish area, Djalu’ exposed a knothole as he carved down the wood. 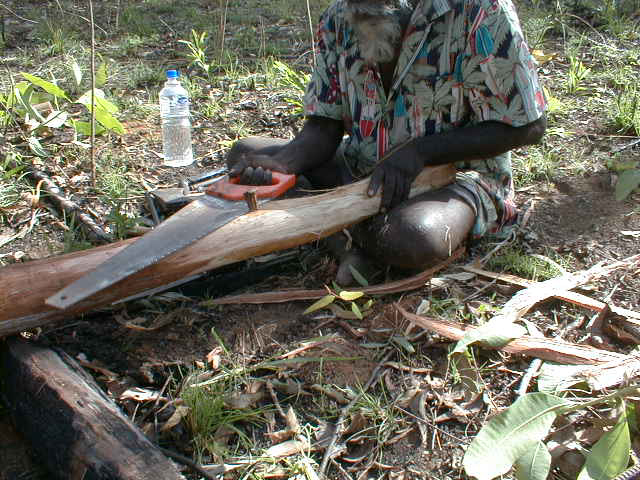 To the right of the instrument in this photo, he is carving a small wedge of wood out of the trimmings. 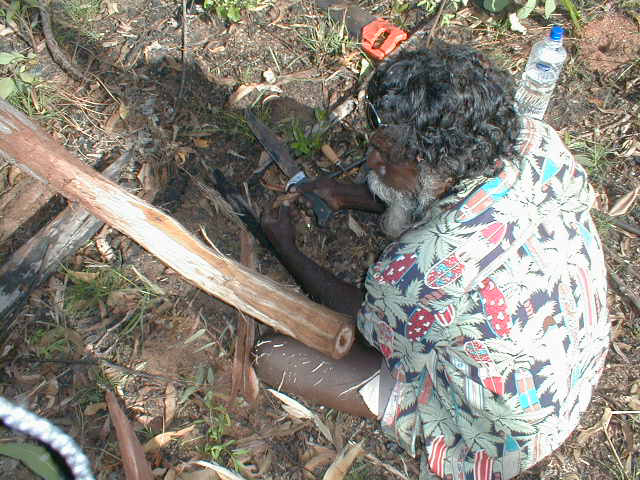 Next, he hammered that little wedge into the hole (with the not often recommended technique of holding a knife blade and hammering with the handle). 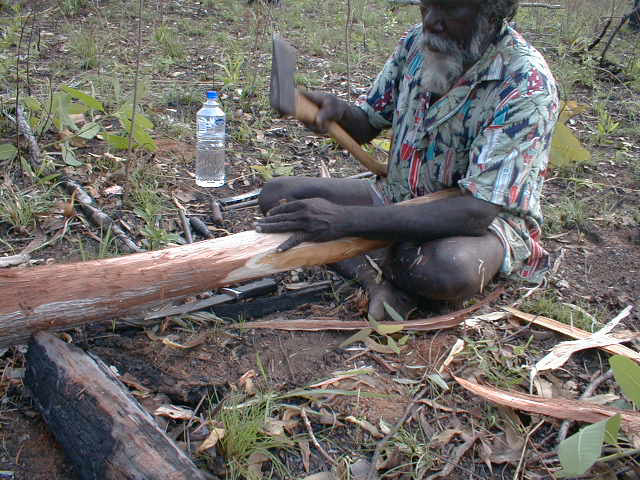 He switched to an axe. That’s better. 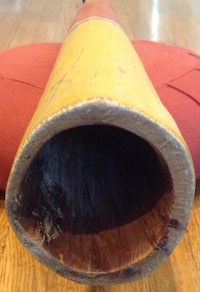 The result: a non-leaky yidaki with a protrusion. 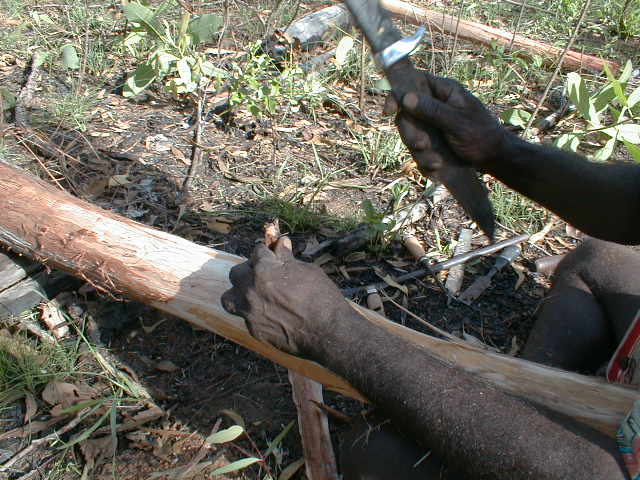 Then, he simply sawed off the protrusion with the blade right against the yidaki. Voila. 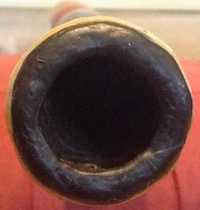 Knothole filled. Good as new. 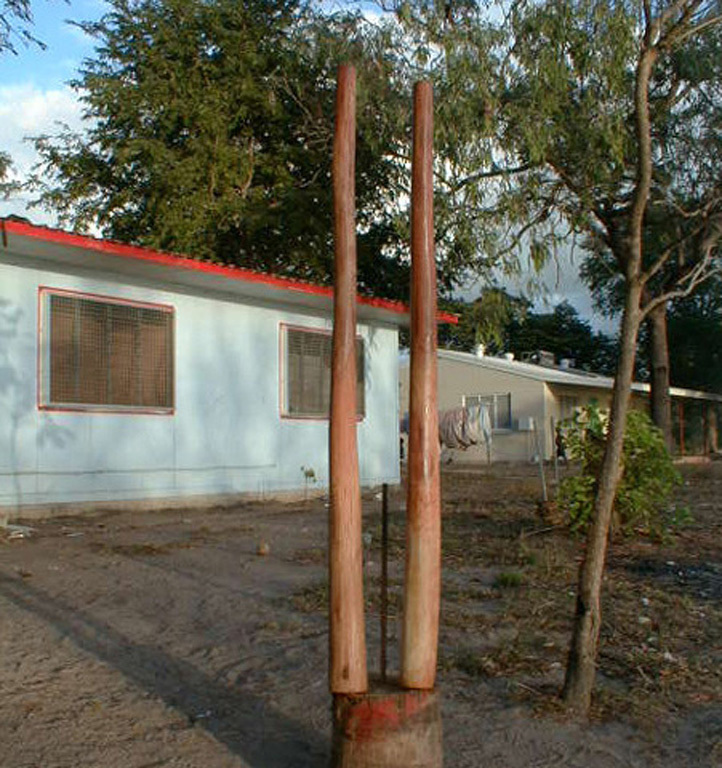 The instrument was finished, glued, painted, and sold to one of you out there who has no idea that this ever happened. There you go. 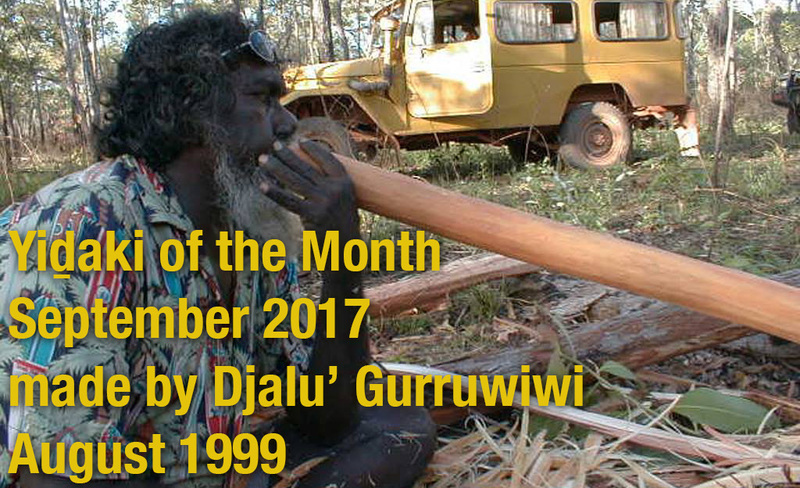 Djalu’ Gurruwiwi, yidaki master with all the cool tricks. 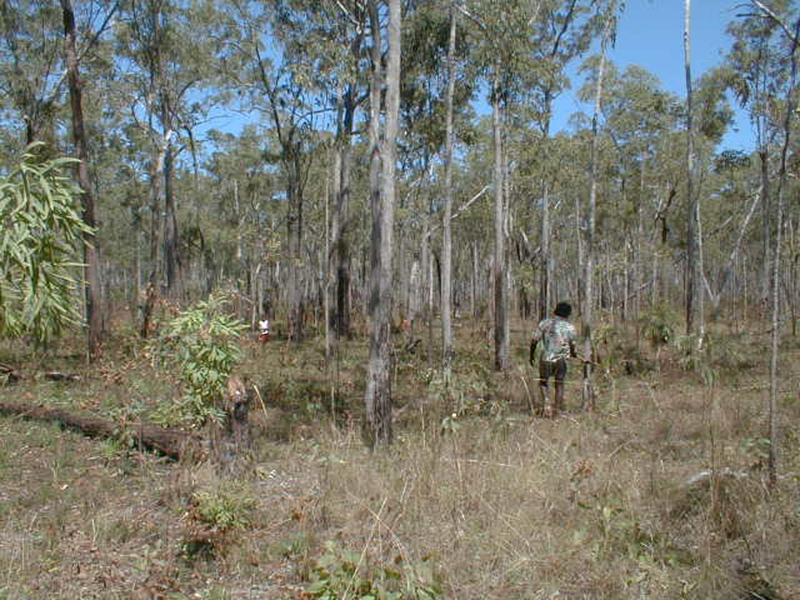 You can see some more photos from that and the following day on the antiquated website about my first visit to Arnhem Land at https://gingerroot.com/oztrip/yirrkala/yidaki/index.htm. 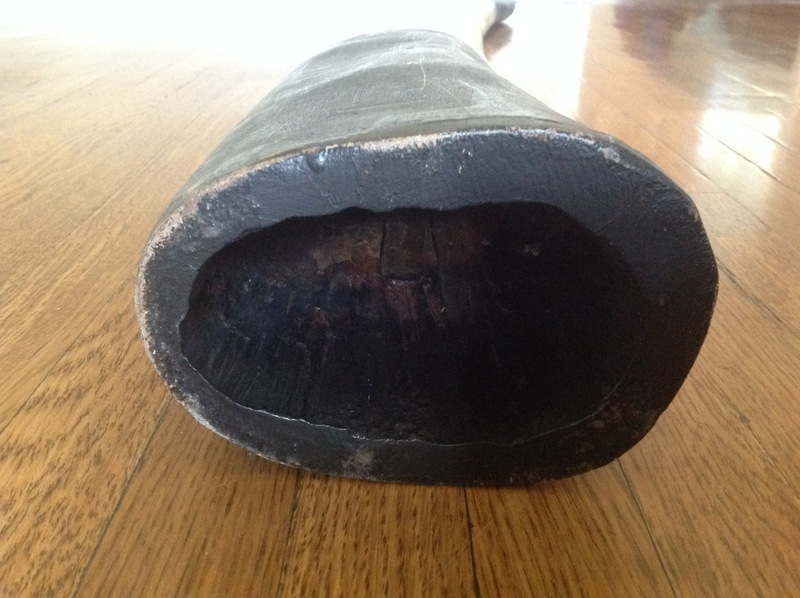 I’ve shown you some really amazing yidaki over the past few months. How about a bad yidaki for a change?